You know those suede shoes you bought last summer? You wear them with everything from vintage Levi’s to floral summer dresses, and they have the scuff marks to prove it. But figuring out how to clean suede is a bit of a challenge. Unlike more forgiving materials like leather, it’s not as easy as wiping them off with a damp cloth. For some professional tips, we turned to the experts at Fast and Best Shoe Repair, who shared their top tricks for cleaning suede the right way. They’re pros at all types of shoe repairs, but they were kind enough to also tell us how to take care of our shoes at home. There are a few different methods they recommend, but one of them involves a $0 trick using an item you probably already have in your house. Want to find out the best way to breathe new life into your favorite suede shoes? Keep reading to find out the four best tricks for cleaning suede, straight from seasoned experts. The top tip the experts recommended would be to get your shoes protected with a water and stain protection spray before wearing them so the suede can keep its vibrancy and freshness. In addition to protecting your shoes, Cadillac Suede Renew works really well to clean and refresh suede in three easy steps. First, brush the suede shoes to clean and surface dirt. Second, apply the spray, making sure it covers the whole shoe and let it dry for 15 to 20 minutes. Third, brush the suede again to bring back the hair, and you’re done. If the shoes are really dirty, your best option is to either bring it to a trusted cobbler for repairs or you can pick up Angelus Angelus Easy Cleaner ($8). Pour 1/4 of the contents of the bottle into a bowl. Dip a nylon brush into the bowl, and start cleaning the shoes. Make sure to always brush toward the outside so you don’t leave any dirt behind. Once you completely wash the shoes, leave them to dry overnight. When the suede is dry, it will feel hard and stiff, so you will need to use a metallic brush to brush back the suede and make it soft again. The last expert tip is to always have a nylon or soft brush in the house. Light water stains and dirt can be easily brushed out, and it doesn’t have to be complicated (plus, it doesn’t cost a thing!). Go on to shop our favorite suede shoes. We can never get enough of Zara’s affordable and fashion-forward options. Your new alternative to a loafer. These pom-poms add a playful touch to this mule. These will always be appropriate for the office. These neutral mules would look great with light-wash denim and a silk cami. Wear this mule with earthy jewelry. 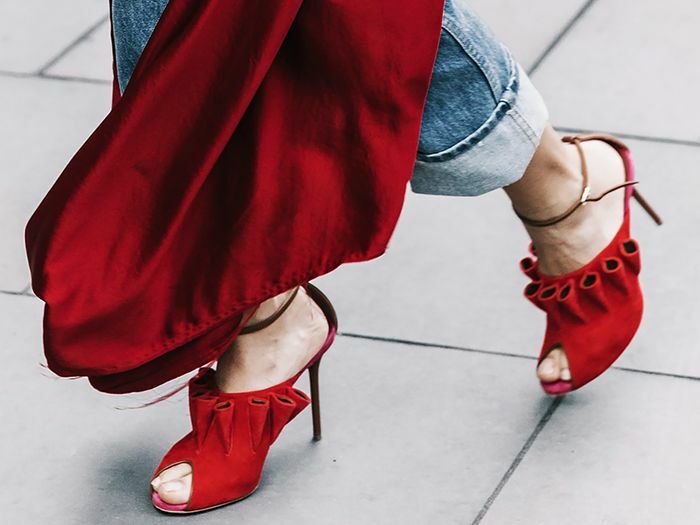 Kitten heels are a comfortable alternative—and they’re chic, too. 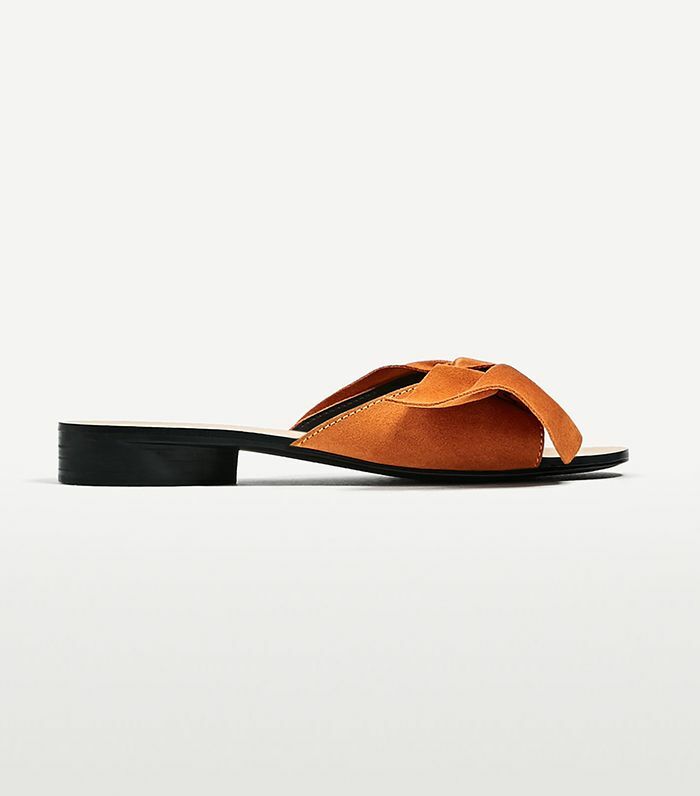 Basket woven slides are a nice alternative to your standard backless shoes. The wooden heel adds a minimal touch. A thick heel always looks good with a simple dress. Pack these for your next vacation. These timeless Gucci loafers are a good choice for anyone who likes a vintage feel. Sport these pumps during the day or into the night. A soft pink suede looks nice against denim. Every editor owns a staple pair of mules. This summer, L.A. girls are opting for this French-girl staple. Geometric grids are flattering on sandals. A black suede block heel is a must-have. Style yours with a chic white dress. Fringe is a stylish and reliable way to add detail to your outfit. Next, find out what French girls pack in their suitcases for vacation.